CNN had an awful headline earlier this week, that I saw mentioned by Jeremy. 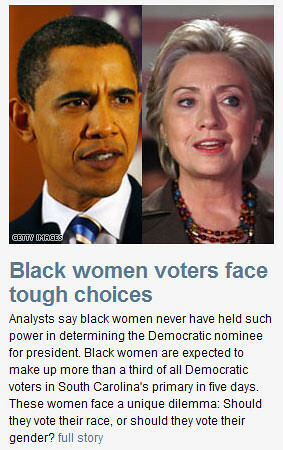 The story basically said black women won’t be voting issues because they’re too set on voting their identity. I guess that makes Edwards the “white male” candidate that he joked about at the debate? Yep, good thing the Republicans don’t have to worry about hard questions like that. They only have issues to look at, instead of gender and race.